Set one hundred years before the events in George R.R. 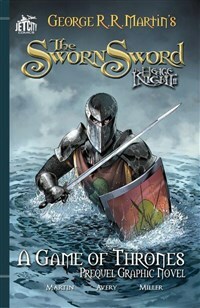 Martin’s epic fantasy series, A Song of Ice and Fire, The Sworn Sword graphic novel follows the adventures of Ser Duncan and his squire, Egg, as they quest for honor and glory in the Seven Kingdoms. After the deaths, surprises, and heroics in The Hedge Knight, Dunk and Egg continue their journey in search of the fair puppeteer Tanselle. Along the way, the elderly knight Ser Eustace takes both men under his charge, alongside another knight—and this one promises trouble. Peace is ever elusive for Dunk and Egg, as they are soon embroiled in the schemes of local nobility, while a darker, greater thread threatens to unravel long-held truths of the Battle of Redgrass Field.